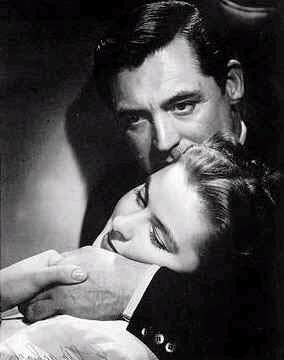 Notorious is one of my favourite films. It is also one of Alfred Hitchcock’s loved Classics and his main wish was to get the love story out of it. Cary Grant and Ingrid Bergman acted in this romantic thriller and the general impression was that they created an on-screen chemistry never before seen in a Hitchcock film. Alicia Huberman (Ingrid Bergman) was a frivolous girl who loved drinks and men; her father was a German spy in the USA and he killed himself in prison. The government agent Devlin (Cary Grant) asked the girl to spy on a group of her father`s Nazi friends in Rio de Janeiro; that could be her chance to clean her guilty name. The girl fell in love with the agent, but he wasn’t happy with the life she was living. Alicia accepted the duty and she went to Brazil with Devlin. The agent wanted Alicia to marry Sebastian, the Nazi spy, and gain free access into his house, so she did. While Sebastian was enjoying the wedding party, Alicia and Devlin found some uranium dust in Sebastian`s wine cellar, but then Sebastian discovered Alicia was a spy and he started poisoning her, day after day. That was the moment when Alicia’s sufferings began. The most touching scene in the film, in my opinion, is at the end of it when Devlin decided to rescue lifeless Alicia. He paid a visit to the Sebastian’s house. Alicia was lying in bed with no strength in her body when Devlin climbed upstairs. As he was moving close to her, he whispered in her ear and asked what was wrong. She told him that Sebastian was poisoning her and that she was dying in the same manner as her father. Devlin was convinced that he had to save her and he revealed his true love while his heart was shivering with pain and rage. In spite of the danger, he decided to carry her to hospital. While he was putting her robe around her, Alicia expressed her fear that Sebastian would not let them walk out of the house. Devlin was struggling to keep her alive and conscious. When they met Sebastian at the staircase, Devlin whispered that he knew what they were doing to Alicia and warned Sebastian not to raise an alarm. Sebastian was powerless to stop Devlin and as they were rushing to the car outside, Sebastian’s Nazi friends realized the deception. Sebastian was married to the American spy and they were more than determined to punish him. So while Devlin and Alicia were driving to hospital Sebastian was facing a death sentence.